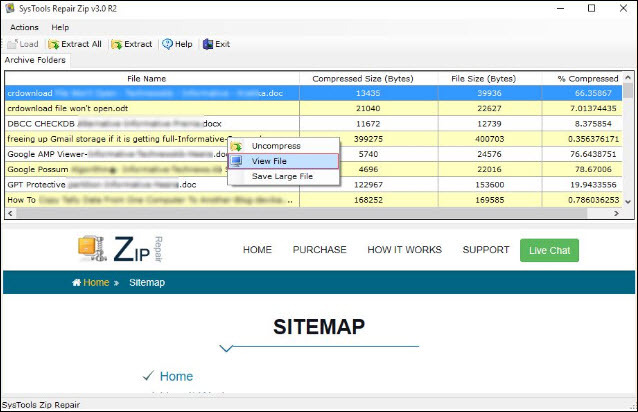 Zip Repair software is integrated with an advanced recovery algorithm that effectively extracts all data and allows users to repair corrupt or inaccessible compressed WinZip files. Zip data Recovery Tool is also used to preview all types of file such as documents, images, text files, etc in a broken Zip file. Preview all types of files such as documents, Images, text etc. 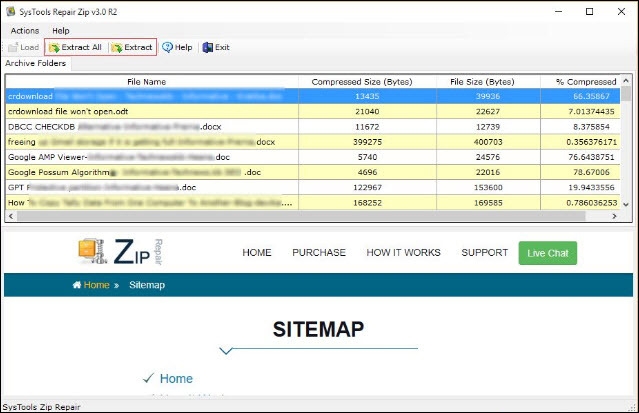 The Zip Repair software is tested with more than 500 MB of .zip file and noticed that it can easily repair any size of the compressed file. The Zip Recovery tool supports WinZip 18.0, 17.5, 17, 16.5, 16, and all other below versions of WinZip. A zip file may be corrupted due to many reasons such as virus attack, Trojan infection, improper shutdown, human errors etc. In such case, Zip Repair tool helps you to deal with this situation and repair corrupted zip file without any data loss. Before recovery process begins, the scans the all types of WinZip file present within an archived file. 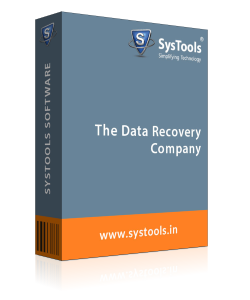 The SysTools ZIP Recovery tool has an option to extract data from damage compressed file and save all these data. For this purpose, the utility will create a .zip file after extracting data from the source Zip file. Then, you can zip or save all the files and items into a single file without any data losses experienced. Once you open and scan .zip file, the tool displays a list in which all the files present within the archive folder. Here, you can see all types of file like documents, images, text files, etc. If you want to get an instant preview and know about associated details of any file, then just click on them. After that, tool let you to view the file name, actual file size, file size after compression, and percentage of compression. Sometimes, people have a very large size of zip file that is inaccessible and they want to repair it. By using Zip Repair Software, they are allowed to compress and recover any size of the zip file. This Zip Data Recovery software is tested with more than 50 MB of the file and repairs them easily. So, the experts state that there is no any limitation with the size of zip file. This Zip Recovery Tool is designed in such a way that it can extract damaged .rar / .zip file on the local machine after the recovery of corrupted .zip file. It also allows users to extract the selected files in compressed format or in uncompressed format according to their requirement. By default, the tool saves the extracted files in an uncompressed format only. When a WinZip file gets corrupted or internally damaged and you are trying to unzip it. Then, there are chances that several types of errors may get generated. Some of them are "Archive is corrupt or damaged", "compressed folder is invalid or corrupted" "unknown compression method", etc. This Zip file Repair software is able to overcome all these errors. 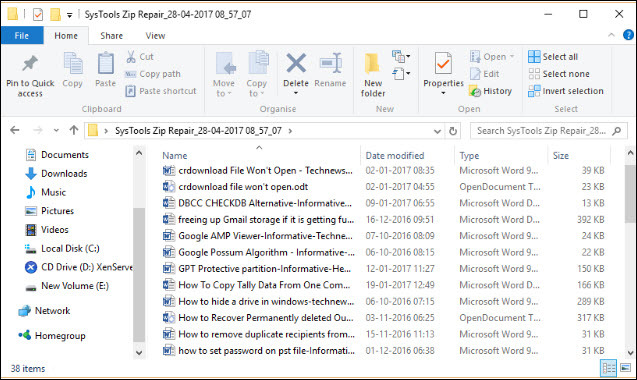 How Does Zip Repair Tool Work in Windows OS? Step 1 : Download, Install and run the Zip Recovery Tool. 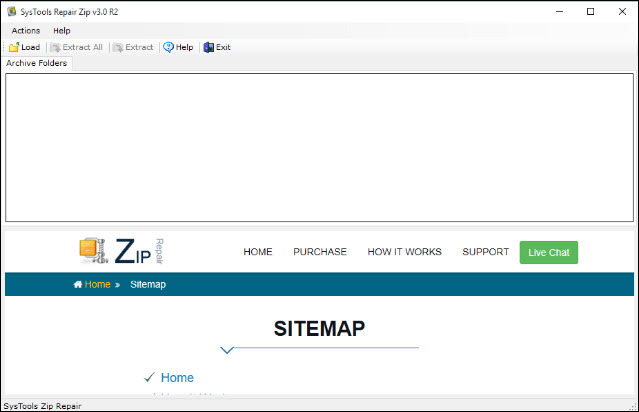 Step 2 : Click on Load button to add the desired Zip files from your system to Zip Recovery Tool. Step 3 : Now, Damaged Rar/Zip File Repair tool displays scanned ZIP file that is added for recovery or extraction. You can preview .zip files and check the files whether they are healthy or corrupt. Step 4 : To check the corruption in a ZIP file, select the file from the Archive Folders >> Right-click on the file >> select View File from the context menu. Step 5 : Next, click on the "Extract All" or "Extract" option to extract data from corrupted Zip file. Step 6 : Choose the destination folder to save the repaired Zip file database and click on OK button. Step 7 : After completion of the extraction process, the tool will show a message "All the file(s) saved successfully". 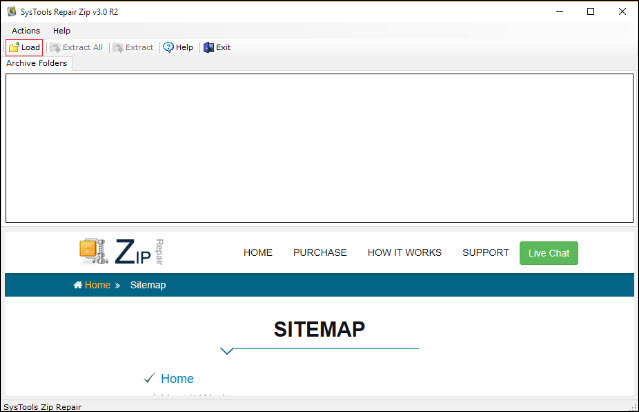 Step 8 : Finally, you can view your extracted Zip file data in the respective location on your machine. Q. Explain how to repair damaged Zip files? 1) At first, Install and open the ZIP Recovery tool. 2) Then, load your corrupted .zip file in it. 3) Now, you can view Zip file data with its attributes. 4) Finally, extract the repaired broken .zip file. Q. Can I use Zip repair tool to recover multiple .zip files at once? Ans: Yes, the software is designed in such a way that you can add any number of damaged .zip files and then repair and extract data from corrupted zip files at the same time. Q. Does Damaged rar/zip File Repair tool compatible with Windows 10 OS? Ans: SysTools Zip Recovery tool is completely compatible to work with Windows 10 and all other below versions of Windows. Q. How much time is needed to recover data from corrupted ZIP file? Ans: The total time taken by the Zip Repair tool totally depends upon the size of .zip file & level of corruption occurs in the Winzip file. Q. Does the tool repair ZIP file that shows an error? Ans: Yes, Zip Recovery tool can easily recover all the .zip files, which are unable to be restored properly due to any error. Note: Zip Data Recovery Software will get delivered on your registered email id, within few minutes after placing the order. I lost my .zip files due to high rate viruses in the system. I tried to get rid of viruses, but fail to do this. Then, I came to know about this tool, which helps me to regain my lost ZIP files. Thanks to SysTools, who provided me such a nice Zip Recovery Tool!! 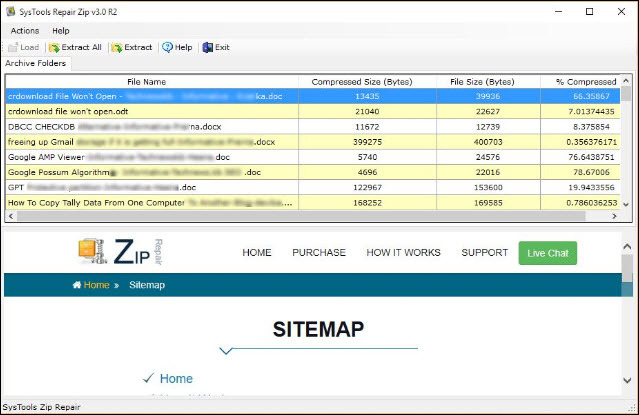 The SysTools Zip Repair software is much better than others because of its marvelous features, price, clear demo, etc on how to repair damaged Zip files. I appreciate the collaborative teamwork to provide the best and useful product to the clients. I am very happy to buy this Zip data Recovery software from you guys!! This Zip recovery tool helps me a lot. Before using this, I have tried many manual tricks but unfortunately failed in that. Then, I purchased this tool online. Now, I am fully satisfied with this application which helps to repair Zip files efficiently and it is having impressive features. Thanks team! !